Nathan Austin earned third-placed Falkirk a point in a thrilling 2-2 draw with Dumbarton. 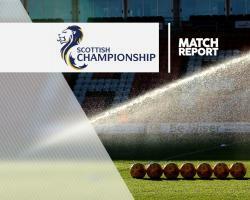 Falkirk started brightly as James Craigen, Austin and Craig Sibbald all had chances to break the deadlock, but the game really sprang into life approaching half-time. Luke Leahy gave the home team a deserved 37th-minute lead with a looping effort, but Lewis Vaughan levelled a minute later with an impressive solo run for his first Championship goal of the season. However, young striker Austin equalised eight minutes later with a terrific shot into the top corner. The Bairns threw everything at the visitors' goal and nearly won it seven minutes from time when Craigen struck a post and there was even more drama to come as Bob McHugh had an effort ruled out for offside.